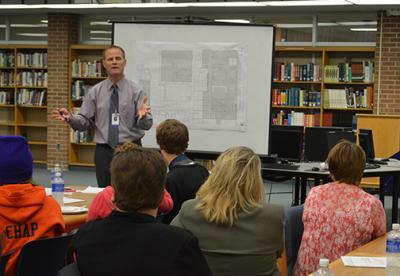 The Glencoe-Silver Lake (GSL) Community Schools meeting on Jan. 22 provided students the opportunity to meet with members of the community to discuss careers. Then the students were allowed to present some of their work to the community members. Above, GSL student Eric Villnow demonstrates the process of using the 3D printer purchased by the engineering department to Glencoe’s David Peterson.